As it has just been over a year since I traveled to Ireland I have decided to dedicated the rest of this week to stories about my adventures in Eire. 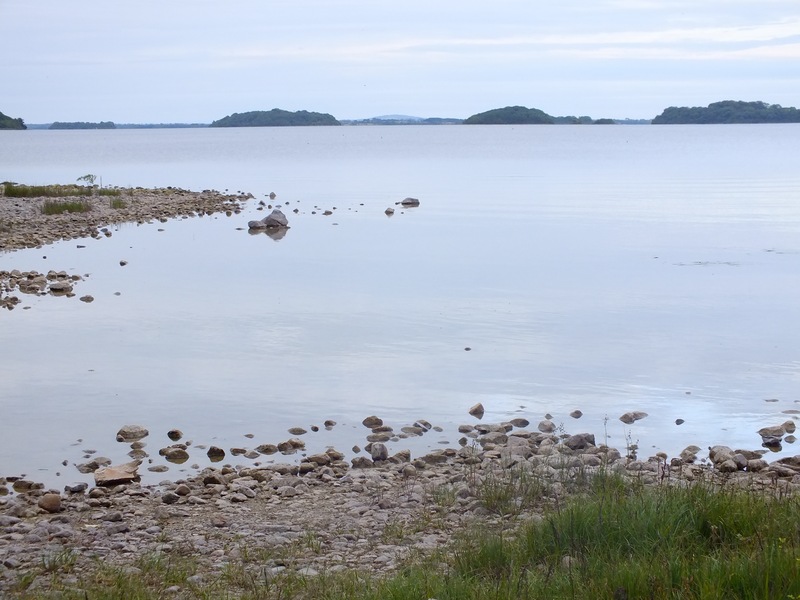 After we’d finished admiring the site of Clonmacnoise (see here), we finally arrived at our hotel in County Galway near the shores of Lough Corrib. 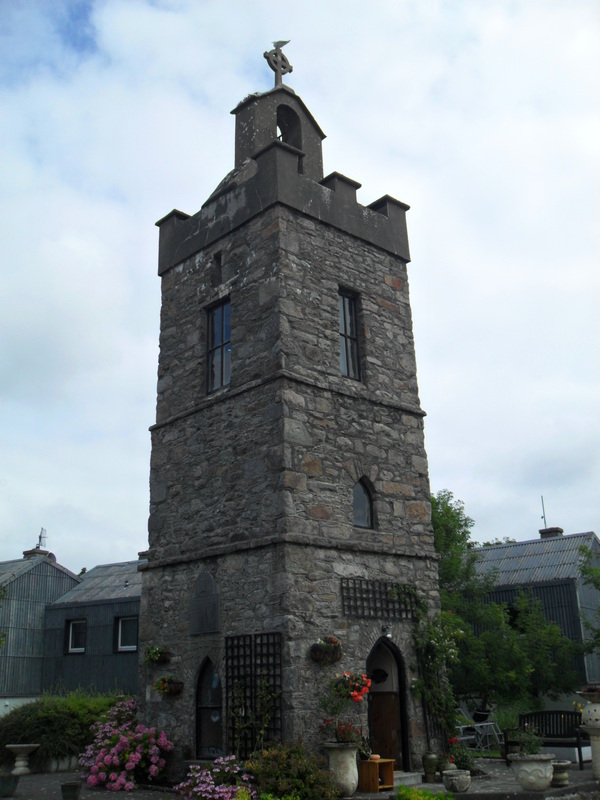 As we only had a few days in Galway before driving down to County Kerry, we decided to see as much of the area as possible, this meant it was time for a Road Trip Day! So the next morning, after a decent lie in to recover from our long day yesterday, we all bundled back into the car and began to drive north to explore the historical Irish province of Connacht. As we drove the clouds began to thicken and darken, but thankfully the rain was refusing to fall. Driving along the N59, we could slowly see the mighty Twelve Bens mountain range rising up in front of us, their peaks obscured by rolling clouds. Although the Twelve Bens are considerably small mountains (the highest is about 2,300ft), the flat land that surrounded them made them seem twice their actual size. 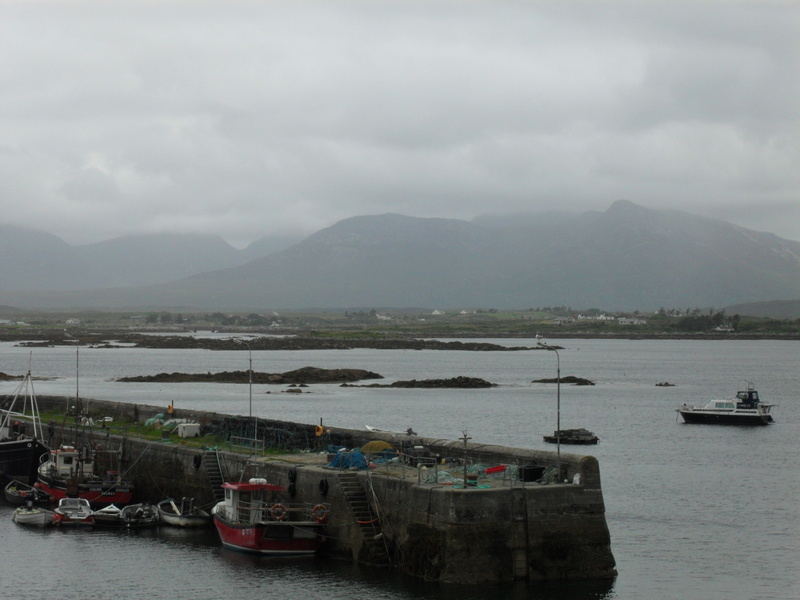 Our first stop for the day was the small harbour village of Roundstone. Although it initially appeared to be a pretty sleepy place Roundstone is in fact a major center of Irish culture,and music with an annual Summer-fest being held in the town and Traditional Irish Nights, offering music and dance, are held on a weekly basis throughout July and August. Today though we were only briefly passing through, however we did pay a visit to the Roundstone Musical Instruments, a store selling all kinds of Irish music and instruments. We ended up buying a bodhran (a traditional Irish drum) for my cousin, a fantastic drum player, to add too his ever expanding collection of drums and cymbals. We arrived next at our first beach of the day, Dog’s Bay, for a quick dip of our toes in the Atlantic Ocean; which was surprisingly warm. 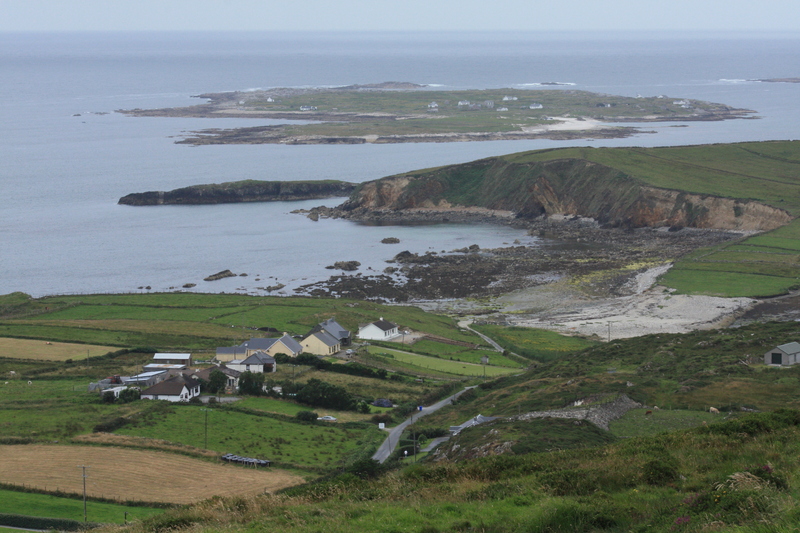 From there we drove up along the coast to the town of Clifden, even in the thick cloud the scenery was very beautiful, the white sands and green hillocks stood in stark contrast to the grey mountains and the turquoise sea. 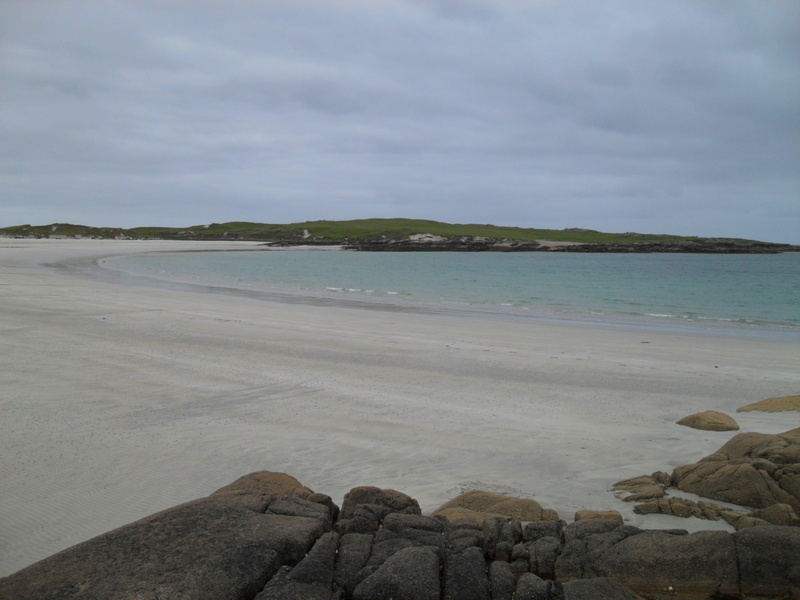 Driving northward, we pulled up in Clifden to buy some lunch, which we then took up to a viewing site on the nearby Sky Road. After we’d finished stuffing our faces, it was up to Glassillaun Beach, which lies in the shadow of the Mwellrea Mountain. 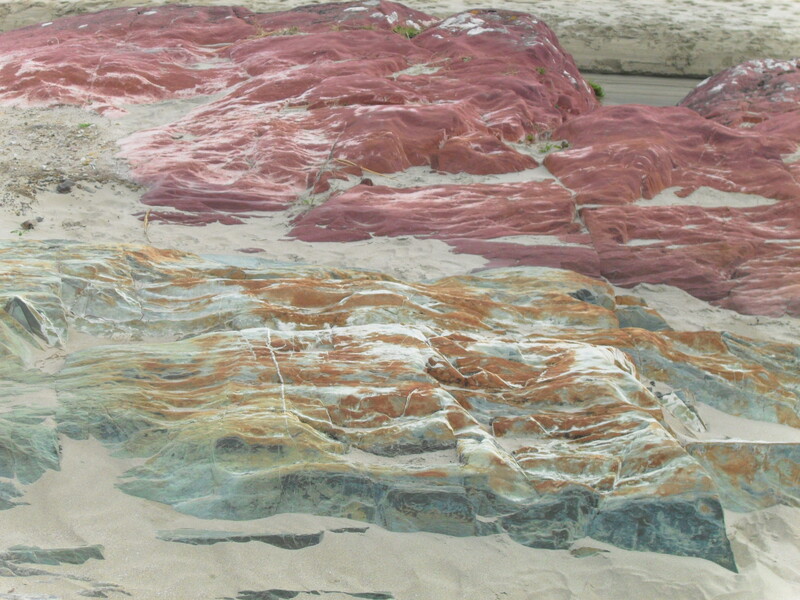 Glassillaun Beach is also famous because of its sandstone rocks, which exist in a variety of wonderful colours and we were looking forward to a nice opportunity to stretch our legs. But upon arriving at the beach I was horrified to discover that the sand was covered with washed up jellyfish (which I absolutely detest). Therefore I spent our entire walk along the shore, stepping gingerly between the jellyfish caresses, certain that one would suddenly strike at me with its stinging tentacles, luckily none did; though I swear some of them appeared to inflated when the tide washed over them. 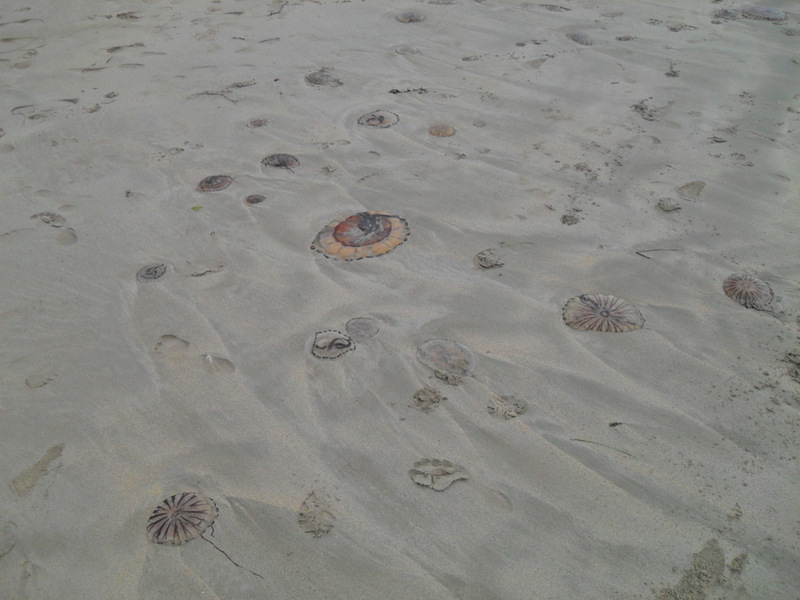 The jellyfish graveyard, some were the size of dinner plates! Glassillaun marked the furthest point of our little journey and we headed back to Clifden and our last stop, the Marconi Station. Following the road south through Clifden we turned right into a farm track, just outside the village of Ballinaboy, this led us across the vast moor that lies between Clifden and Roundstone. At the end of the track stood a transmission station, the site of Marconi’s first regular trans-Atlantic wireless service which was established between the Clifden Station and one in Glace Bay, Nova Scotia on October 17, 1907. Sadly though the building was attacked by Republican Forces in 1920 and today little remains of the original building and regrettably next to nothing has been done to preserve this historical site. 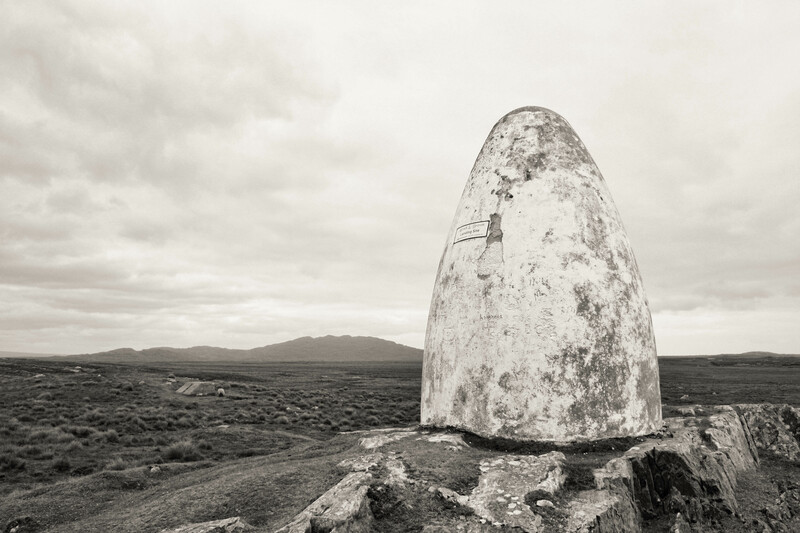 Just a stones throw away from the site is also a monument to John Alcock and Arthur Brown who, after completing their famous trans Atlantic voyage, crash landed on the moor. I always enjoy road trip days as it is a good way to see and explore any country, especially if you only have a few days and there are a number of sites you want to see. Thanks to this method we could leave Galway satisfied with all we had seen, despite our limited time.